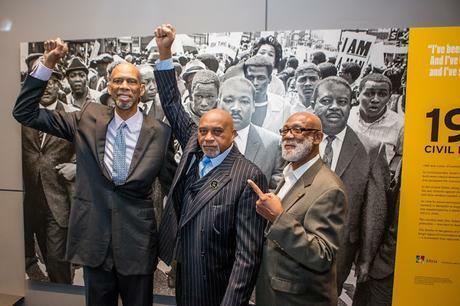 Dr. Tommie Smith (center) and Dr. John Carlos (right) both accepted Newseum Free Expression Awards for their protest on the medal podium at the 1968 Summer Olympics. On April 17, the Newseum presented the 2018 Free Expression Awards, now in its third year, to a group of individuals who exhibit passion for and dedication to free expression. The honorees have taken personal or professional risks in sharing critical information with the public, have been censored or punished by authorities or other groups for their work, or have pushed boundaries in artistic and media expression. The New York Times Company chairman and former publisher of The New York Times Arthur Sulzberger Jr. received the Lifetime Achievement Award for his work to shape and implement innovative print and online initiatives at the Times. During his tenure as publisher, the paper earned 60 Pulitzer Prizes and provided its readers with innumerable examples of momentous journalism. "The Newseum reminds us that great journalism has many purposes: to inform, to enlighten, to challenge and to surprise," said Sulzberger. "The highest and noblest role of a free press is holding power to account. That's been true throughout our nation's history but it is especially true to remember today." Dr. John Carlos and Dr. Tommie Smith both accepted awards for their brave protest on the medal podium at the 1968 Summer Olympics. Together they lowered their heads and raised their gloved fists in a silent protest of the mistreatment of black Americans and people of color everywhere. Kareem Abdul-Jabbar, retired professional basketball player for the Milwaukee Bucks and the Los Angeles Lakers, presented their awards. Thirteen journalists from four news publications received a Free Expression Award on behalf of all journalists who uncovered sexual misconduct in the workplace. Their work broke through a dam of suppressed stories and silenced voices to reveal decades-long harassment throughout the American workplace, including media, film, sports, manufacturing, the arts and Congress. Charlie Hebdo cartoonist Laurent "Riss" Sourisseau received a Free Expression Award for his fierce defense of the fundamental right to free expression. In January 2015, terrorists attacked the Charlie Hebdo headquarters in Paris, killing 12 of Riss's colleagues in revenge for the newspaper's caricatured portrayals of the prophet Muhammad, founder of Islam. In the three years since, millions have marched under the banner "Je Suis Charlie" ("I am Charlie") and, undaunted, Riss and his colleagues continue to exercise their freedom of expression to satirize the pompous and powerful.